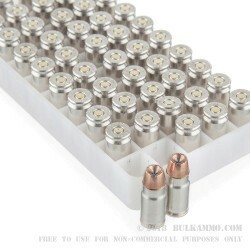 Hot 357 Sig rounds for self-defense, home defense or duty purposes, this is the culmination of many years of research and development with the backing of law enforcement contracts en-masse. Speer is among the leading firms year after year, for volume of law enforcement contracts, and this is the ammunition they have refined to a point of near perfection for the task at hand with the resulting information they are able to gather through their law enforcement connections. The already amazing .357 Sig round is a powerhouse cartridge for normal sized duty weapons, and this is no exception to the performance curve of the round. 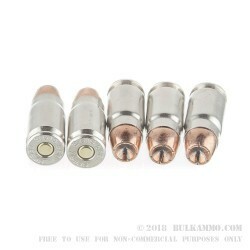 These Speer loads offers 1350 feet per second velocity out of the barrel and 506 ft. lbs. of energy at the muzzle. 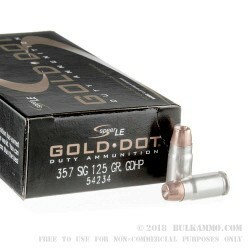 The proven Gold Dot projectile has gotten even better, with enhanced mechanical jacket bonding to the core lead projectile. Speer was the first to offer a mainstream pistol caliber truly bonded jacket hollow point projectile to the duty round market. This is an improved version which virtually eliminates weight retention concerns. 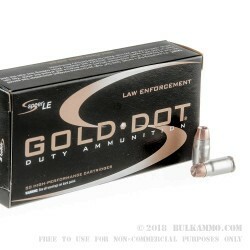 The Gold Dot is among the most proven projectiles in history for the personal defense and duty markets in pistol calibers There is an extreme value add as well, with the high quality nickel plated brass cases that are Boxer primed – which offer premium reloading brass donors.